In the 1700s, when Porthmadog and Blaenau Ffestiniog did not exist, this part of Wales was a remote mountain area. In the last few years of that century, W.A. 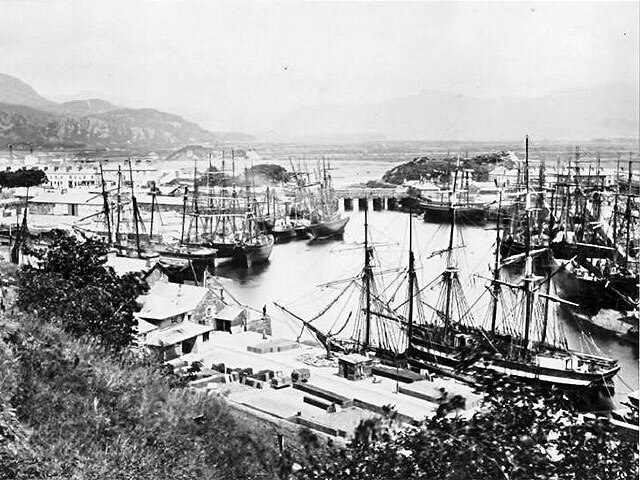 Madocks had acquired land and soon afterwards carried out land reclamation projects culminating in the great embankment - 'The Cob' - right across the Glaslyn estuary, literally creating a new harbour, called Port Madoc, known today as Porthmadog. The workmen for this huge project were housed in a building at the eastern end of the Cob, where the workshops of the Railway are now situated. Since Madocks was the MP for Boston in Lincolnshire, he called the building 'Boston Lodge'. The Cob took 4 years to complete, but only a year later partial rebuilding was required when high tides and a storm breached it. At a similar time, high up in the mountains around Blaenau Ffestiniog, slate deposits were being exploited in small quantities and laboriously taken by pack animal and farm carts over rough roads down to the River Dwyryd. Here the slate was loaded into river boats for transport downstream where it was loaded yet again, this time into sea-going sailing ships. This long-winded system was expensive both in the time taken and the quantity of broken slates during transport. 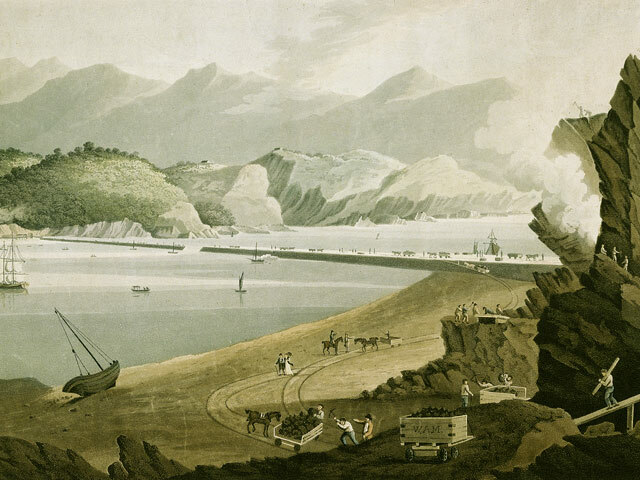 In 1830, shortly after Madock's death, Samuel Holland, who was quarrying slate at Rhiw, joined Henry Archer, a young businessman from Dublin, to promote the Festiniog Railway, incorporated by Act of Parliament on 23 May 1832. James Spooner from Worcestershire was responsible for the survey and construction of the Railway. The route, whose final mile crossed the Cob, enabled loaded slate trains to run down by gravity while the horses that were used to haul the empty wagons back up the line could ride, feed and rest in 'dandy' wagons. 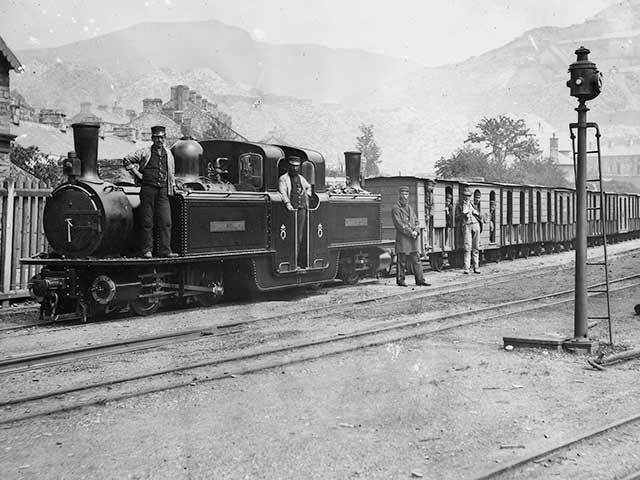 The 23.5 inch gauge (just short of 2 feet), corresponding to that being used in the quarries, was wide enough to allow the horses to work efficiently when pulling the empty wagons and narrow enough to enable the Railway to negotiate the sharp curves made necessary by the mountainous terrain. The wagons were small enough to be loaded easily and man-handled in the quarry and at the port. As slate traffic increased, the horse and gravity system of operation came under strain and thoughts turned to the form of power then making such an impact on transport elsewhere - the steam engine. But in the 1840's, steam locomotives on so narrow a gauge were thought impracticable; in fact carrying passengers was illegal on new railways of less than the British standard gauge of 4 feet 8.5 inches. These factors delayed the introduction of steam and it was only after Charles Easton Spooner (James' son) took control of the Railway in 1856 that he looked more closely into the question of steam locomotives and eventually contracts were signed with George England and Co., London, for four small locomotives. In July 1863 'The Princess' and 'Mountaineer' were delivered and they entered service in October. The other two, 'The Prince' and 'Palmerston', arrived in 1864. 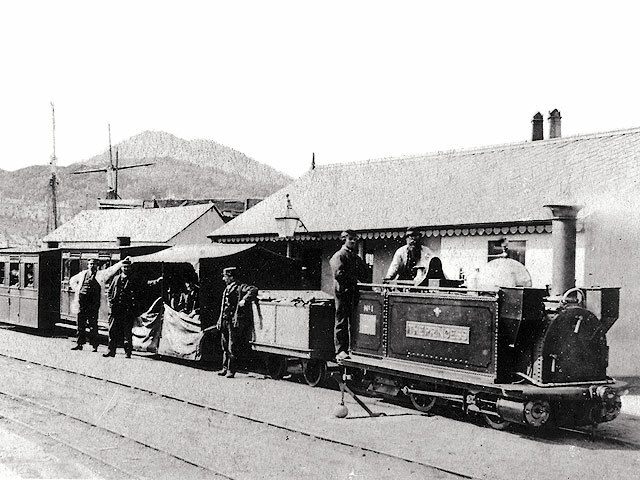 In the same year, the Board of Trade gave the Railway permission to run passenger trains, the first on a narrow gauge in Britain. The four-wheeled carriages were very low to keep the weight as central as possible and some of these unique vehicles survive as part of the Railway's valued heritage. From 1866 primitive carriages also offered a cheap service for quarrymen. As traffic increased two more, slightly more powerful engines, 'Welsh Pony' and 'Little Giant', arrived in 1867. 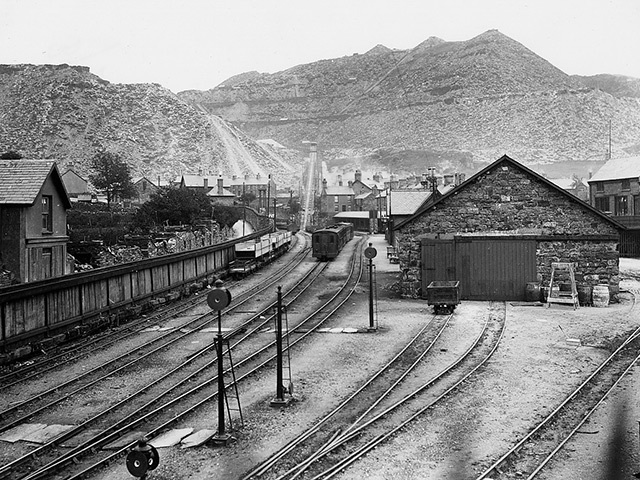 By then the limitations of a single line were also becoming restrictive due to the sheer quantities of slate being transported and in 1869 an Act was passed permitting the line to be doubled.